"Red lithographic stone printing on map. Shows cities, roads, fortifications, canals, major public buildings, etc. Relief shown by Form lines and spot heights.. This little-known map of Switzerland by Joseph Edmund Woerl is an important record of the Swiss road network in the early 19th century. It is also an outstanding example of early lithographic map printing. Woerl seems to have pioneered a method of using color lithography to show roads and important places and towns - he used a red lithographic stone for a second overlay printing. Espenhorst speculates that Woerl may have used a unique combination of lithography and engraving to produce these maps - in fact plate marks are clearly seen. The quality of the lithographic work is exceptional - the lines are as fine as those resulting from engraving. Espenhorst also states that Woerl may have studied with Senefelder, the inventor of lithography. In 21 parts (19 maps 52x63, at a scale of 1:200,000, a title page and index sheet) placed in modern cardboard case 54x64, with title ""Woerl Atlas der Schweiz"". The title page shows many different scales and their equivalents. The maps were published by Harder from 1831 to 1835. 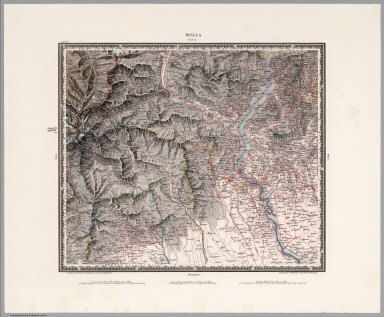 The Bavarian cartographer Woerl compiled his maps from different maps of the time, but especially on the basis of the Atlas Suisse which was published in Aarau by Johann Heinrich Weiss and others. Woerl's Karte der Schweiz was part of the larger 48 sheet Karte von Sudwest-Deutschland und dem Alpenlande, begun in 1831 and completed in 1843. Several other extracts were taken from these 48 sheets, include Wurttemberg (12 sheets - see our copy), Bavaria (24 sheets), Tirol (12 sheets). The assembly sheet for the 48 maps and some of the Bavaria sheets are included with out Wurttemberg atlas."